We want to be your community resource when you're buying a home and when you've settled into your home. One of the ways we can serve you is to provide you with the best services Kansas City has to offer. Sometimes that will be a great jazz bar, and other times it will be the necessities, like insurance, financial planning, or a good plumber. Today we want to introduce you to a great financial investor, Victoria Bogner, and share with you her take on today's market. Maybe you will recall that the S&P 500 fell 11% in 5 days back in August 2015 and there was much panic? That would be the equivalent of the Dow Jones Industrial Average falling over 2,900 points in one week. 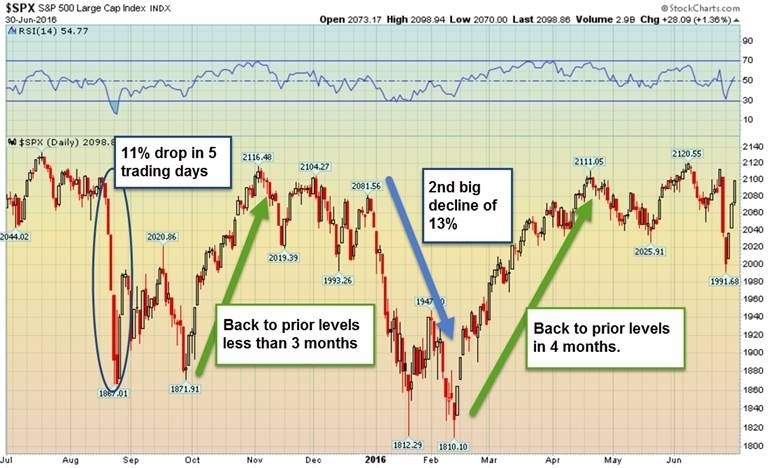 Less than three months later, the S&P was back to pre-pullback levels. After some sideways movement, the market did a ‘retest’ of those lows in early 2016. Market pundits were pulling their hair out. The market swiftly fell 13%. But those that panicked and sold out of the market during that pullback would have felt good about their decision for only a month or so before the market recovered over the next two months. As you take a good look at the graph above, imagine being back in that period? If an investor sold their stocks in January 2016, when would they have known to jump back into the market? The last part of January looked promising, but the market swiftly fell even lower the next month. Following that February low was three skyrocket days in which the market gained back 5%. Does one jump back into stocks after that? It is impossible to know without the gift of hindsight. That is the problem with timing the market – it’s based on luck, not skill. This is why we are so adamant about not trying to time pullbacks when we do not see risks of a recession. As we have been saying in lots of prior commentaries, if we are not in a recessionary environment, pullbacks are not to be timed. They tend to last 3-6 months. They are sharp, sometimes severe, but short-lived in the grand scheme of things. Like earthquakes, they can happen suddenly, and by the time you know it is happening, there’s not a whole lot you can do about it besides run to the nearest door jam or dive under a sturdy desk. Unlike buildings and roads demolished by natural disasters, the stock market can build itself back up pretty quickly. As long an investor does not panic and feeds into fear, their portfolio will hopefully be at pre-pullback values in 3-6 months. After a stellar 2017 and an incredible January 2018, the S&P 500 has given up all gains made so far this year in just a little over a week. What makes this pullback look so ugly is the lack of volatility leading up to it. What caused it? Mainly interest rates. Since former Chair of the Federal Reserve Janet Yellen has left, and Jay Powell is sworn in as the new Chair, markets are anxious to see how aggressive he will be in pushing for raising rates. The ten year Treasury yield has risen pretty quickly to 2.83%, a level we have not seen since 2014. Folks are scared that interest rates rising too far too fast will put the skids on the economic recovery. But how high is too high? According to FactSet, it is 5%. If rates are below 5%, stocks tend to rise along with rates. We are at 2.83%, nowhere near 5% yet. What does that tell me? In my opinion, it says this is a panic pullback and not the beginning of a bear market. It might go lower. It might get uglier. But it is a pullback we were expecting. This is what I have been training and preparing you for, dear reader. Moreover, what has been most gratifying through these past few days is that for those of you I have spoken with, you do indeed feel well informed and prepared. We will keep a close eye on this pullback as it unfolds.